Have you ever tried to get directions from old people in a small town? "Yeah, go down the road until you get to the flower shop that used to be a gas station, then turn right and go until you get to the empty lot that used to be a Denny's. Turn left, and head on past the old school." I think it's kind of impressive how someone can have numerous overlapping versions of a city in their head, keeping track of not just what a place looks like now, but how it looked thirty years ago. Although it does make their directions incomprehensible to young people. 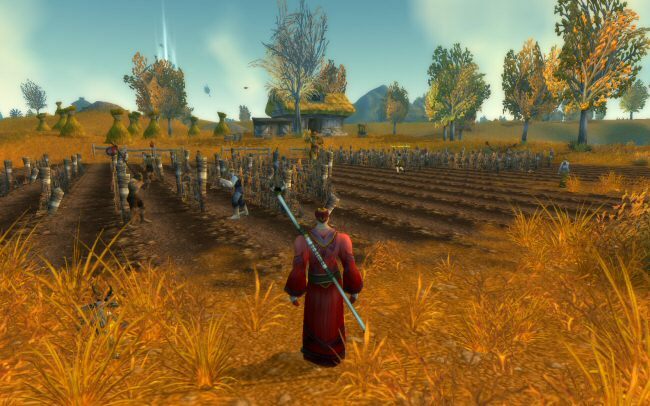 World of Warcraft is now suffering from this. 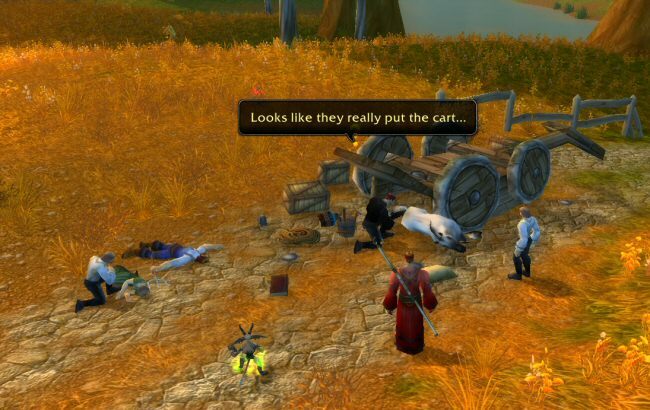 Pre-Cataclysm, these two idiots were standing here along with their horse and a loaded cart, giving out quests. Their story was that they had been driven from their homes by bandits and were fleeing Westfall. Their quests had you running around, gathering up stuff for them. One quest had you get feed for their horse by running around swiping sacks of oats from other farms. So now quests and locations are often references to how things used to be. This is not a bad thing, it's just odd to see this phenomena appearing in a virtual world. We have arrived in Westfall to find a murder scene. One detective Horatio Laine is conducting an investigation. Since Norman is a rube, he stops to see if our help is needed. The detective turns to us, "Here's the deal, kid ..."
"I'm twenty-five," Norman says. "And my partner is like, a million years old or something." "We've got a full-blown murder on our hands. Double homicide ... Single horse ... icide." "Horse murder would be 'equicide,'" Norman says. "Worse yet, we're in Westfall. I could throw a rock behind me and hit a dozen hobos with enough motive to want to wipe these people (and horse) out." "Motive? They were broke and homeless. The only thing they had of value was their horse, which was killed with them." "Now I don't know who did this and I sure don't appreciate having to come to this dump to investigate the deaths of a couple of squatters, but I'll be damned if I don't find the perp. You want to help?" "Good. Go talk to some bums. The hobo ... knows." Now this game is filled with memes and pop-culture references. For example, there's a fashion designer named Harris Pilton. But this CSI one is a bit odd because of how obvious it is. This isn't a sly wink or a nod to a meme, this is outright participation. Which is odd, because is probably won't age well. 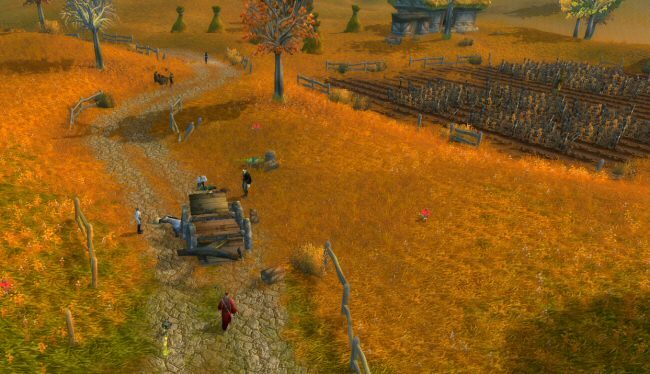 The quests in original WoW ran for six years before getting an update. Imagine how stale the CSI joke will be six years from now. Imagine if there was an "All Your Base" quest in the game right now, where you have to talk to a guy named Cats and move a zig. It would feel pretty rusty, and this quest is probably doomed to a similar fate in a couple of years. It cracks a smile now, but in 2015 this will be met with a shrug or an eyeroll. I nod at the vast field of hobos in front of us, "Good crop this year. Really poor and smelly." "I guess we just ask these guys if they saw anything?" Norman shrugs. We walk up to one of the dirty bums standing around the field. Norman gives him a couple of coppers and asks him what he saw. His answer is that he tries to kill us. "You can't buy me! DIE!" he screams.